PureTech Window Cleaning has 20 years experience in providing high-end window cleaning services. We tailor our methods to each individual customer by combining both traditional methods and modern purified water-fed-pole systems. Whether you’re a regular client or require a one-off-job we strive to do excellent work each and every time. As a result our customer retention, satisfaction and loyalty is second to none. 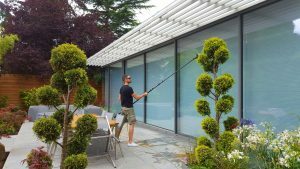 Providing both companies and householders with an outstanding and professional window cleaning service we specialise in high-end homes and the intricacies that they bring. We are also experts at ‘one off cleans’, ‘first cleans’ and ‘construction cleans’ where more time and skill is involved to ensure the windows and frameworks are clear of built-up dirt and debris. If you’re thinking of putting your house on the market and would like to show your home at it’s best, we can provide a full external surface and internal glass clean to help with the marketing. Alternatively please complete the contact form which you kind find by clicking here.